Waiting to meet my editor last week in Foyles, I came across a book cover which stopped me in my tracks: a stunning colour portrait of one of my favourite artists. 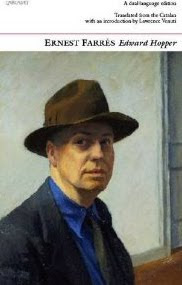 Inside Edward Hopper was a collection of poetry by Ernest Farrés, published by Carcanet Press. On opposite pages was the same poem in Catalan and English, each in response to a Hopper painting. 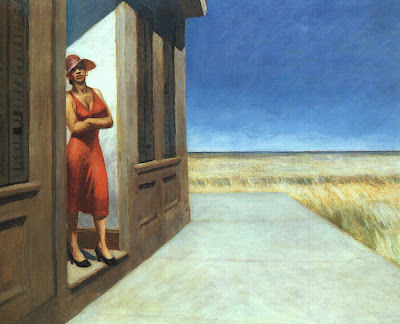 I have been a passionate admirer of Hopper’s work for years. 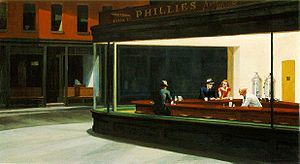 His iconic painting Nighthawks (1942) served as an inspiration for a chapter of my book, The Double Happiness Company. At least two other Hopper paintings have wormed their way into my fiction . . . or tried to. There is a picture of Eileen Flynn in the family album. His late-night diners, anonymous lobbies, lonely gas stations and empty streets are visual literature. “If you could say it in words,” Hopper once said, “there would be no reason to paint.” I, for one, am glad he was such a mysterious, prolific artist, allowing us to stand before his canvases to ponder his elliptical meanings for ourselves.